We’d love your help. Let us know what’s wrong with this preview of Returning to Silence by Dainin Katagiri. For twenty-five hundred years Buddhism has taught that everyone is Buddha—already enlightened, lacking nothing. But still there is the question of how we can experience that truth in our lives. In this book, Dainin Katagiri points to the manifestation of enlightenment right here, right now, in our everyday routine. Genuineness of practice lies in "just living" our lives wh For twenty-five hundred years Buddhism has taught that everyone is Buddha—already enlightened, lacking nothing. But still there is the question of how we can experience that truth in our lives. In this book, Dainin Katagiri points to the manifestation of enlightenment right here, right now, in our everyday routine. Genuineness of practice lies in "just living" our lives wholeheartedly. The Zen practice of sitting meditation (zazen) is this not a means to an end but is the activity of enlightenment itself. That is why Katagiri Roshi says, "Don't expect enlightenment—just sit down!" 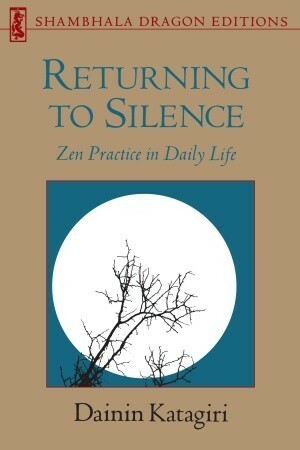 To ask other readers questions about Returning to Silence, please sign up. Dainin Katagiri's book is refreshingly open and honest. No instant enlightenment here - only beautifully poetic meditations on what it means to be a real, caring human being. Throughout the book is a slightly regrettable tinge of sadness, though. Katagiri hasn't found, nor will he give you, any final answers. In the early years of our marriage, my wife and I used to invite a 90-year-old man, a scientific colleague of my father's who STILL worked part-time - a Russian who fought for the Czar during Dainin Katagiri's book is refreshingly open and honest. In the early years of our marriage, my wife and I used to invite a 90-year-old man, a scientific colleague of my father's who STILL worked part-time - a Russian who fought for the Czar during the Revolution - over to our place for Sunday dinner. Bless him, he often got lost and had to ask for directions as he drove through our endless new suburbs with almost identical houses! One evening while waiting for the Sunday roast to be finished I passed old Mike this book. Then he turned to me and said, "You know, Fergus, THIS is the book I've always wanted to read!!" So I loaned it to him. I'm on at least my third copy now. It's THAT good. During WWII, when Japan was being strafed and bombed by American planes, a sensitive Japanese doctor was called to operate on a downed Yankee airman, who had crashed. The operation was interrupted by more bombing. Everyone in the OR scrambled for the shelter - even the guards. But not the kindly surgeon. And you know what? The airman survived. But the doctor was condemned to death as a traitor. The night before his execution, however, he was STILL thinking positive. I am able to laugh when I am happy. I realize how precious it is to be born human. Even if I am fed up with this ugly world, Look! Great read for those interested in Buddhism that already have some background. "La vacuità è ciò che ci permette di aprire gli occhi per vedere direttamente che cos'è l'essere. [...] Dobbiamo assumerci la responsabilità dei risultati di ciò che abbiamo fatto, ma l'obbiettivo finale è quello di non farci ossessionare dal risultato, che sia buono, cattivo o neutro. È questo che chiamiamo vacuità. Questo è il significato principale della vacuità. [...] La cosa importante è non farci prendere dall'ossessione o dalla fissazione per i risultati che vediamo, sentiamo e sperimentiamo. Tutti i risultati, buoni, cattivi o neutri, vanno accettati fino in fondo. Non dobbiamo fare altro che seminare buoni semi giorno dopo giorno, senza lasciarne traccia, senza creare alcun attaccamento. [...] Accade sempre qualcosa. Questo è lo zazen. Ecco perché lo zazen è identico alla vita. L'importante è accettare fino in fondo le cose che accadono. Se vedete qualcosa che va corretta, correggetela. Se non c'è nulla da fare, limitatevi a non fare nulla. Qualunque cosa accada, dal principio alla fine, continuate semplicemente a fare del vostro meglio nello zazen. Non dovete fare altro. Nello zazen la mente viene regolata; avere una mente regolata significa non avere alcun presagio di diventare un buddha. Questa è la vacuità. Il Buddha è sempre presente in 'ciò che semplicemente è'; buddha semplicemente è. Se crediamo di comprendere noi stessi, già questo non è precisamente 'ciò che semplicemente è', o quiddità, ossia un essere come si è. Questo qualcosa che semplicemente è, o quiddità, non è una condizione che possiamo conoscere attraverso la coscienza. Nel Buddhismo zen si dice che è "quel sé che era prima che i nostri genitori nascessero", o prima del prodursi di un qualunque pensiero. Questo è il sé prima che qualcosa attraversi la coscienza. Il problema è che la nostra coscienza è sempre al lavoro, e va di qua, di là, in tutte le direzioni, attimo per attimo. Perciò, come possiamo conoscere lo stato del 'sé che era prima che i nostri genitori nascessero', ossia la quiddità, ciò che di una cosa semplicemente è? [...] Il modo migliore per compiere questa indagine è mettersi semplicemente seduti a fare zazen, lasciando che il fiore della forza vitale sbocci nella quiddità. Very good information, but sometimes difficult to understand. The book is based on lectures, not a concerted effort to sit down and write. It's also a book that one should study, not necessarily read from beginning to end to arrive at a conclusion. The content is heavy at times, and if one has little experience or practice in the Zen Buddhist tradition, one can become lost pretty quickly. This is not a beginner's Zen text by any means. Short, but dense. There's a lot to unpack in this book. A dense but deeply humane, humble and challenging book. A whole different beast from the many new age self-help Zen manuals out there. Stunning book on the essence of Zen; of interest to anyone (with half a brain) interested in aesthetics. Incredible book on Zen, not to mention an essential link between the spiritual and the aesthetic.